In addition, you'll need to lock your exposure after deciding what you feel will expose best for all the variations in light in the area you'll be photographing. If you don't lock your exposure you will get what is known as "banding." Banding is when you have all different exposure values (darker and lighter) showing like slices throughout the many pieces in a stitched panorama. I typically begin by setting my camera to “Aperture Priority” (Av) mode and then moving the f-stop setting to either f/11 or f/13, for maximum depth of field, carefully checking the view finder to note the shutter speed that the camera has automatically chosen to get a properly exposed picture. I next switch to Manual mode and dial in that f-stop and shutter speed. Very often you will be taking pictures where the sun is on one side of the picture and it can be quite dark or shaded in other parts. While some panoramic stitching programs are fairly good at equalizing the exposures, there will still be a lot of ugly variation in your finished file unless you lock the exposure. Illustration: Sunrise on Blue Hill Bay, Blue Hill, Maine: a 10 image panorama. Each shot you take should be overlapped by 20 to 25% as you will get better stitching results. Illustration: Tumbledown Mountain, Weld, Maine - a 20 image, 180 degree handheld panorama. 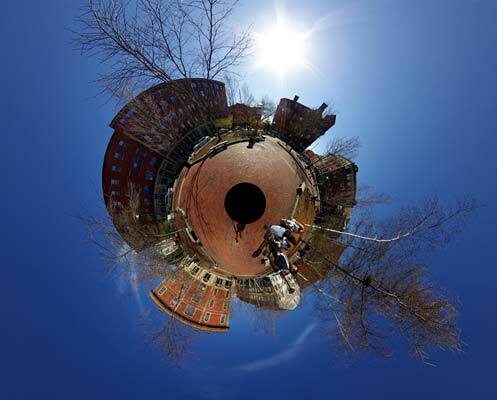 Illustration: Tommy's Park, Portland, Maine - a 45-image handheld panorama, stitched in Little Planet Projection using PTGui. Finally, let's talk about how to put your panorama together. I sometimes use a program called PTGui, but mostly Photoshop CS4 stitches them together with great results. Not everyone has Photoshop OR PTGui of course... And there are quite a few free stitching programs out there to download that people have great success with, such as Hugin and ArcSoft Panorama Maker. 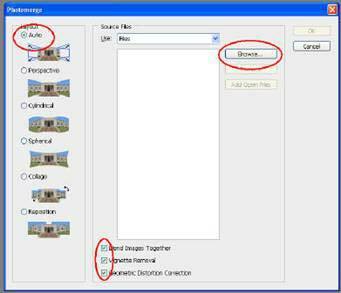 For ease of explanation, I'll demonstrate how I put together a panorama in Photoshop CS4. Geometric Distortion Correction. 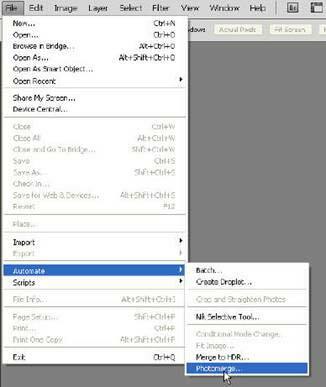 Then click the Browse button to select the files you want to stitch together. 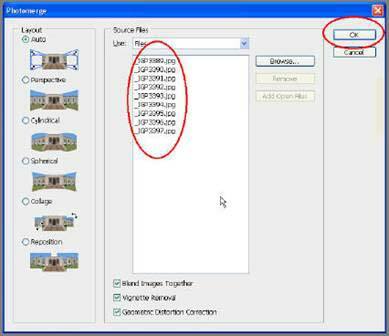 When your files are selected in the Source Files box, as seen below, click OK and let the pano-making begin! The size of the files. How level each shot is. The computer's CPU speed and amount of memory. 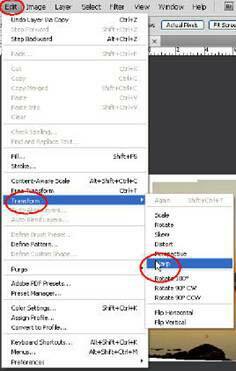 If you are using Photoshop CS4 in 32-bit or 64-bit. Notice how the edges are rough and the right side curves upward a little? Apparently, I didn't have my camera as level as I thought I did! This is easily fixed in Photoshop by using the Warp command. A grid will be placed over your entire image (see below). You can pull on any of the dots or corners to re-shape your pano exactly as you'd like it by clicking on them and dragging gently in the directions you want to go. Notice how in the large red oval the off-kilter horizon has been mostly corrected. You can continue “warping” your pano until you're satisfied with the results. 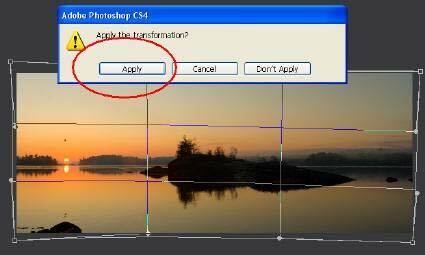 And then, simply click on the Crop tool in the tools palette and a window will pop up, asking if you'd like to apply the transformation. Click apply, and after a few seconds, your pano will be ready to crop.